We know a lot of you have been keenly waiting for it, so we’re very pleased to release our first class list for the year. We have some exciting new classes for you (look for the * in the schedule) and, of course, we will be re-scheduling all those you already know and love! 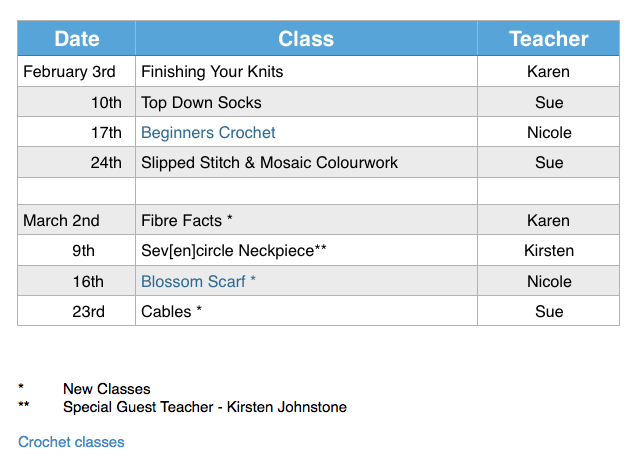 We have also changed the format a little – we will run the classes concurrently with school terms. There will be a total of 4 published class lists per year. We feel that this format will make it easier for you to diarise your classes as you won’t need to commit as far in advance. As usual, classes will be held in the shop on Wednesday nights from 6.15pm – 9.15pm. The schedule is shown below and a full description of each class can be found on our website here. Very excitingly, we have a special guest teacher this term, the very talented Kirsten Johnstone. Kirsten flies the flag for Aussie designers internationally and has designed for Brooklyn Tweed, Shibui and Woolfolk. We are thrilled to have her teaching a class for us and you can find out more about her on her website. We would like to introduce you to a new ‘in-house’ teacher – Nicole. You will know her as the lovely gal behind the counter but she is a great teacher as well. Nicole will be teaching our crochet classes. You can read more about her (and our other teachers) here. Categories: Classes, Uncategorized | Permalink.